Seaweed, called limu in Hawaii, has gotten a lot of attention in recent years. About 500 types of marine algae exist, but nearly 300 are non-native to Hawaii and are destroying the state's coral reefs. Scientists have created a machine called the Super Sucker, which can detach up to 800 pounds of harmful seaweed in an hour. Another issue surrounding the algae is that many of the harmful species resemble the native species, resulting in confusion during removal. A native, edible seaweed, the ahnfeltiopsis coccina limu aki`aki is usually found on the islands of Hawaii, Maui and Kaui. 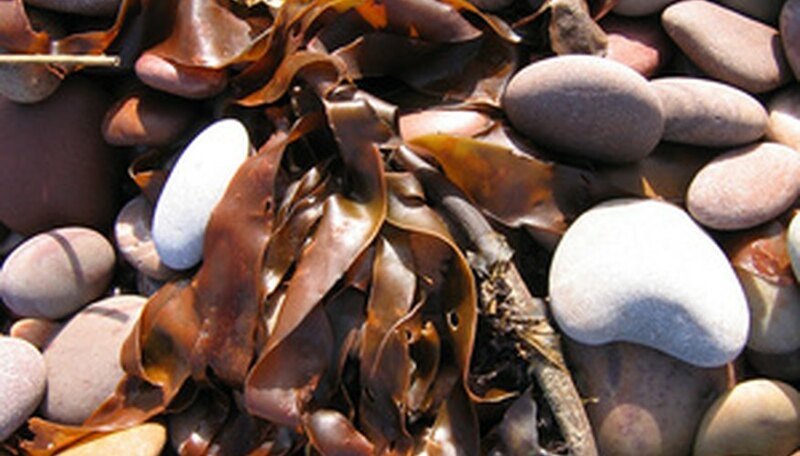 The seaweed, which is a rhodophyta or red algae, grows in both thick, matlike spreads and in cracks of the basalt rock. In the sun, it takes on a yellow color; in the shade it appears dark red or brown. Codium edule is a chlorophyta, or green algae, commonly sold in Hawaiian markets. Its species name translates to "rat's foot" because of the seaweed's forked appearance. C. edule is soft and takes on the appearance of felt, with a spongy body and forked branches. Native to Hawaii and found in all areas, this is a very common edible seaweed. Also called prickly seaweed, the acanthophora spicifera is a big problem for Hawaiian coral reefs and boaters. It is the most common invasive species in the state. It thrives all around the islands and in such great quantities that eradication, or even control, of the seaweed is not possible. Spiny seaweed spreads in two ways. It attaches itself to the reef and overtakes native species and it also breaks off and floats, sticking on the hulls of boats and clogging up the water. Gorilla ogo, species name gracilaria salicornia, is another non-native invasive seaweed. Gorilla ogo breaks off into small pieces and drifts onto the beaches of Hawaii, making the water less desirable to swim in and therefore impacting the local tourist economy. Gorilla ogo is not used as food by any of the coral reef dwellers, so it disrupts their habitat and food chain as it displaces more beneficial algae. Gracilaria parvispora, or long ogo, was the most common seaweed in Hawaiian markets until the 1970s. Due to its wild popularity as an ingredient in many types of cuisine, long ogo was overharvested and the government restricted its growth. Hawaiians traditionally grew long ogo in floating baskets in fishponds. When it started to be harvested on the reefs, overgrowth quickly occurred and threatened native species and habitats. Long ogo is still widely used today, though there are restrictions on its harvest.